If you would like additional time, please contact us to discuss additional studio time rates. 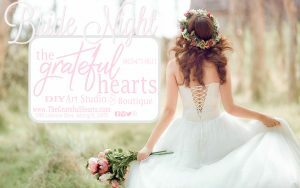 You are welcome to decorate and bring food & drinks (even wine & Beer if desired – Must be 21 or older to enjoy alcoholic beverages ) We are a NUT FREE STUDIO (NO NUTS of ANY kind or in any recipe is permitted in our studio) We will open 30 minutes prior to event time to allow for decorations/set up. Please make sure all set-up is complete and guests are present by the workshop start time.